we warmly suggest that you take the LCD to the service center,and let the phone installed. We will not charge it if the LCD is damaged by the buyer during the phone install process. It is only fit for Samsung Galaxy S6 Edge Plus,not compatible with any other iphone models,each piece of item was tested by professionals to keep the product quality in best condition. 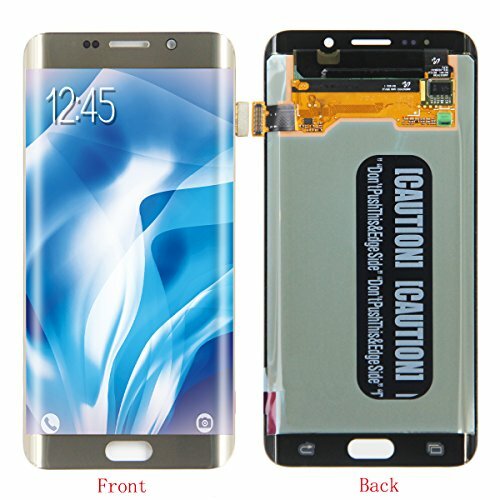 Please be noted:It is not fitted with full functions for cell phone,no with home button.Mainly made of back light + flex cable+frame + touch screen + LCD display etc,you could Replace your damaged,dead pixel,cracked,shattered screen with it to make your cell phone look like new cell phone. Please rest assured to buy from our side,because we have checked the appearance of our LCD screen to ensure no scratches or breakage,and tested the touch three times to ensure to provide you with sentitive hand slippery experience,no dead angle on the screen,and 6 months warranty for non-human factors damage. Please replace your defective screen according the manual book step by step and watch some related videos while install ,also dont use too much energy to press it to install while replacement. If you have any questions about this product by HJSDtech, contact us by completing and submitting the form below. If you are looking for a specif part number, please include it with your message.